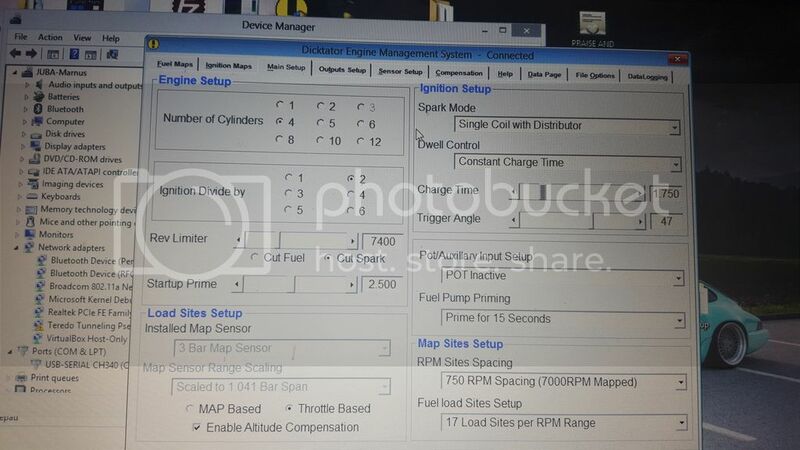 Anybody that can help me with dicktator and ignition maps. Just like to start the car please quick course anybody? In the ignition map do i set everything to 0. 0r rather set motor to 20deg before tdc and set everything in the ignition map to 20deg. 16v Kr motor on carbs running dicktator for ignition curve. you set the motor and distributor to TDC. then you have to give it a reference value which I think is like 40-45 on dictator. Then you enter ignition advance values in the timing map. So start at 8 degrees or so and at 7000 rpm you should have around 30 degress - extrapolate the rest sort in between and it should work okish till can be tuned. actually there is a base map on their standard set of software that comes with the unit you can just load and it should run. If you can't find that Pm me an email address and I'll mail you a few. Thanks Panic. Great to see the old guys still around. Seems with the new cd they dont give maps on the cd anymore. Do you mind sending me details please. Car started before. Car idle so that i can check if the radiator comes on. Radiator comes on. Switch car off. Next day car is dont want to start. Engine turns but doesnt start. Timing is set to tdc. Replaced the ignition wires no luck. Replaced dissy cap and rotar arm still nothing. Running dicktator with the dicktator tp100 unit. I can see the rpm on the dicktator when i crank it so tp100 and dicktator is getting signal. Check the spark and for some reason the spark looks way to weak. Cant do allot of testing because battery dont last very long. Can it be the battery? If anybody can give me more info on how to "sync" the engine ignition with the dicktator that will be great. Like i said car did start before. marnus wrote: I give up. Did you save the map it was running on the previous day in the ECU? I would start there and check all is still the same and then move to checking all wired connections. as you say spark seems to be weak. Could be a weak wire connection somewhere. Also where is your vacuum source for the map sensor coming from? Switch to table (matrix) mode on the software, open the timing map, swing the car and look on the timing map and see which cell goes red, should be one of the bottom right cells, around 250 rpm or so. The value in that block should be around 5 BTDC. If its in a block where the the timing is too fast or slow it may not start. Dwell time should also be max 2.5 ms.
No vacuum source running. Running altitude compensation. What must the trigger angle be? But car did start before. Using a tube coil. Fitted a 2 pin coil got way better spark but now the spark plug keep on sparking even when just the ignition is on. panic-mechanic wrote: you set the motor and distributor to TDC. then you have to give it a reference value which I think is like 40-45 on dictator. Then you enter ignition advance values in the timing map. So start at 8 degrees or so and at 7000 rpm you should have around 30 degress - extrapolate the rest sort in between and it should work okish till can be tuned. Did you confirm this in Dicktator? Permanent spark lead me to think your value is 0. 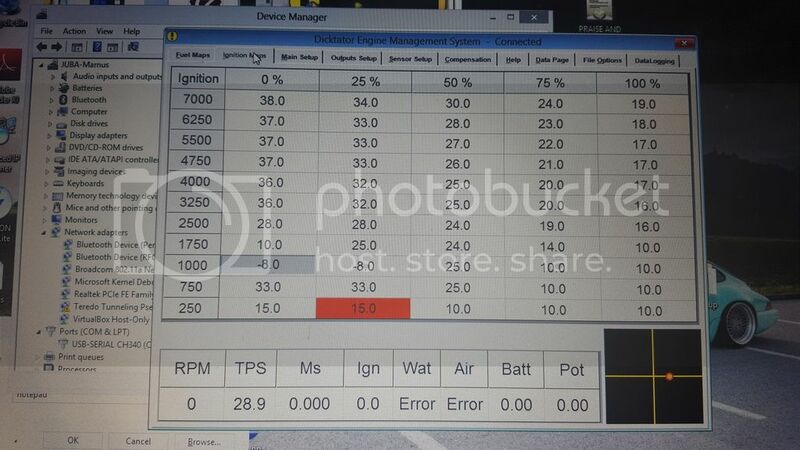 Take a screen shot of the ingition setup as it is on the ECU and post it here. Would be easier for us to assist then. Also what do you mean no vacuum source? Do you have a TPS on your carb(s)? How is the ECU adjusting the timing? When you swing does the Dicktator trigger signal light flash? THANAS wrote: Also what do you mean no vacuum source? Do you have a TPS on your carb(s)? How is the ECU adjusting the timing? suspecting something wrong (wiring or ECU setting) somewhere and resulting in this. The thing I don't understand with this situation is why the dictator in the first place? Is the car in question a race car or similar? Would not a standard 7/5 pin ignition module have been simpler and less hassle? missioner wrote: The thing I don't understand with this situation is why the dictator in the first place? Is the car in question a race car or similar? marnus wrote: Anybody that can help me with dicktator and ignition maps. Dizzy straight to TP100 will be lesser hassle and straight forward. Maybe he is using dizzy for trigger pick up only and want to trigger coil from dicktator. Not sure. He states that with ignition on, he has permanent spark. Fubar TP100 or wrong setting on Dicktator. Suggest he go and wire dizzy to TP100 without the Dicktator and let the dizzy do the trigger via TP100 only. KISS principle. Keep it simple! I double checked the wiring and its all 100 if its was the wiring the the car would not have started before. Im running the dicktator for the advance curve the kr motors came with the black knock box that ran the advance so im using dicktator. Was thinking of connecting just the tp100 but its the 1 from dicktator from my understanding it cant run without dicktator. Maybe i must get a normal tp100 and just test it. It works with any old tp100. It's a lie that it only works with the dictator box. Make your charge time 2.5 as well. 1.75 is a bit short. Okay, so you're running TPS, but do you have a TPS sensor on your carbs? Or am I missing something. That ramp from -8 to 33 Degrees is a means of idle control, but on a MAP car, the cranking MAP value sends the timing map to the right hand side of the columns (close to ambient air pressure). On a TPS car, the throttle is basically closed so to get to idle, it has to crank against probably 20-23 degrees of advance, which will flat out stop the motor from turning. Change the 75-100%/250-750 (4 blocks) all to 5 degrees, and when you start your car, depress the accelerator pedal all the way down until it fires, then release. Why is uk guys running trigger angle at 60. Is the trigger angle for wasted spark only? You don't need tps nor manifold presure normanything to get abasic fixed ignition curve to start the car. Once it is running you can maybe put it on manifold presure to vary the curve. For now it will go up and down with rpm in one column. Trigger anlge is the refence value. So whenyou shoot timing with a light you adjust that value until it agrees with what you read off the mangement.